Ever needed to buy a plastic bag when shopping? Never again in Nolans of Clontarf! 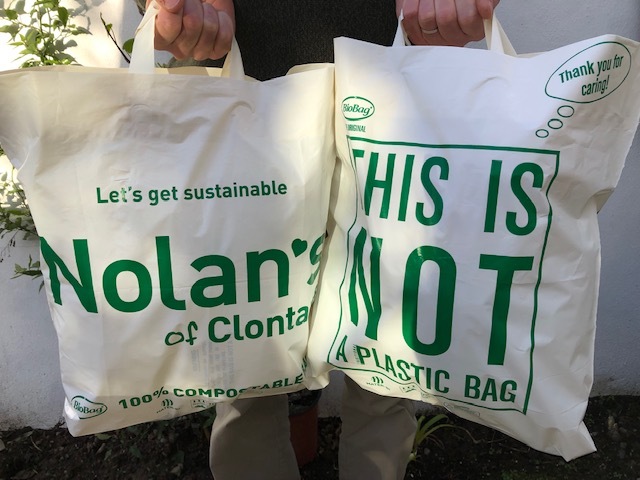 BioBag Ireland was delighted to be asked last year by one of Dublin’s best independent retailers, Nolans of Clontarf , to help them with their ‘lets get sustainable‘ initiative. 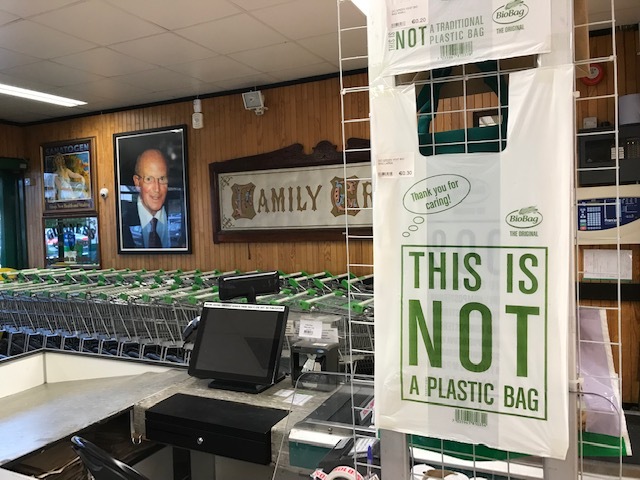 Nolans supermarket has a long standing commitment to reducing the use of plastic in store. They asked BioBag Ireland & Uk if we could assist and we were delighted to do so. Working with Nolans, we produced a range of bespoke, reusable shopping bags for customers who need to purchase a bag at the till. Unlike any other ‘Bag-4-Life’ bags being sold in Irish supermarkets, the Nolans BioBag shopper is 100% compostable (and biodegradable) and approved by all global authorities as suitable for both home and industrial composting. Other reusable bags available in supermarkets are currently not reycleable in Ireland. Our bags are all made from natural, sustainable plant-based materials. Strong and robust, they can be reused again and again on shopping trips, or used to collect food & garden waste. At the end of their usefulness they can be put straight into a Brown/Organic Bin or Home Composter. Our bags will break down to water and CO2 in upwards of 12 weeks ; leaving no micro-plastics behind in the environment. All BioBag products are certified GMO free. These heavy-duty, compostable BioBag carrier bags would also be perfect for trade-shows, hotels, conferences, promotions as well as other innovative retailers. Get in touch with BioBag Ireland & UK if your business would like to know more. Contact Rory on +353 86 77 00213 or rory@biobagworld,com. I sure hope these bags are available here in Canada.